Promote your logo with executive appeal! Use the extra space and organizational skill of this custom portfolio to your advantage. Three business card pockets, one clear ID pocket, one medium pocket, one zippered pocket, one pen loop and one gusseted document pocket leave your most important resources at hand. Opposite the organizer is an 8-1/2" x 11" lined notepad for recording your business transactions. One additional slip pocket on the front cover provides a place for you to tuck in any extras. Secure all your bits and pieces with the full wraparound zippered closure. Simulated leather gives the personalized padfolio a luxurious look at a cost-effective price. 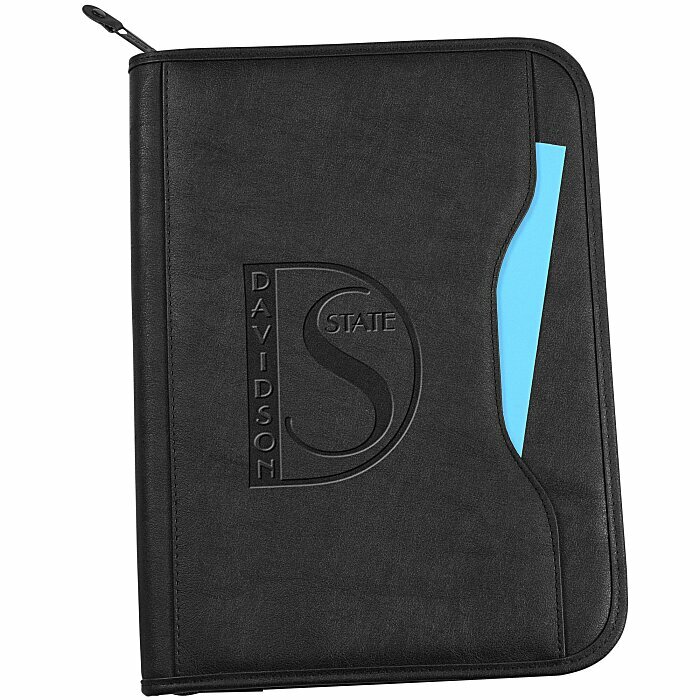 For the screen-printed version of this padfolio, see item #124191Deluxe Executive Portfolio. Size: 13-3/4" x 10-1/4" x 1".